Empryo(#2), Kr Mr Winter(#7) and Rock Winners Jese(#5) qualified in the fourth trial. BOSSIER CITY, LA--MARCH 3, 2018--A colt by multiple stakes sire DOMINYUN broke his maiden in his first career on Saturday while posting the third fastest time for the $238,090 Harrah's Entertainment Futurity (G3) at Louisiana Downs. 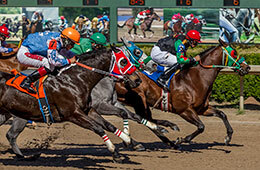 Harrah's Louisiana Downs hosted seven trials this afternoon and the ten top qualifiers will return on Wednesday, March 21 for the $238,090 Harrah's Entertainment Futurity(G3). The winner of the 300-yard final will earn $107,140. Jockey Gilbert Ortiz rode Empyro to a neck win over fellow qualifiers Kr Mr Winter and Rock Winners Jese in the fourth trial. Owned by Ezequiel Araiza and trained by Rodolfo Sanchez, the son of DOMINYUN completed the 300 yards in :15.825 seconds to secure the third fastest time. A $28,000 TQHA Yearling Sale graduate, out of the First Down Dash mare Sizzling Lola, was one of two qualifiers bred in Texas by Bobby D. Cox. For a complete list of finalists, times, sires, dams, owners, breeders, trainers and jockeys CLICK HERE.